Walking treadmill vs Running treadmill – What’s the difference? Tread Lightly, Sure, but Make Sure You Do Tread! Would you love to exercise more and break out of the bad habits you’ve developed over the years? Perhaps you’d love to dedicate some of your time on a daily basis to working out, even if it’s just a little running. For many people working in 9 to 5 jobs though, this isn’t possible. What’s more, most of us have very sedentary lifestyles compared to our ancestors, even those that only lived around 80 to 100 years ago. When you’re stuck behind a computer or on a phone headset all day at a desk, you’re depriving your body of the exercise it needs. Therefore, health issues such as obesity and cardiovascular diseases are so common nowadays. Well that and our diets. And once you suffer from one of these conditions, your work and lifestyle is affected detrimentally. It really is a vicious circle. So how do you go about devoting adequate time to exercise while you’re stuck at the office for the largest percentage of your working life? You bring fitness into the workplace with an under desk treadmill, that’s how. Some of you will already have seen these, while some of you will be scratching your heads with confusion. To explain it succinctly, under desk treadmills are just like normal treadmills, with the big difference being that they don’t have the handle bars or the large console at arm’s length. Instead you just get the actual treadmill section that’s designed to fit underneath a standing desk or workstation. They also tend to have a much lower speed range, as running and working, especially operating a computer, is obviously not a very good combination. So, now we’ve covered the basics, it’s time to get down to it. Rather than have you do all the hard work, we’ve done a lot for you and now want to present to you our 6 favorite treadmills designed for setting up under your desk! We’ve highlighted this as our budget choice because although it’s the lowest priced, it’s still packed with great features, a slick and low-profile design. One of the first of its kind on the market, we just had to highlight this awesome piece of fitness equipment. This is lightweight, well-designed. Due to its impressive weight capacity of 400lbs, we wanted to highlight this desk treadmill because it’s the most versatile and inclusive model in our buying guide. 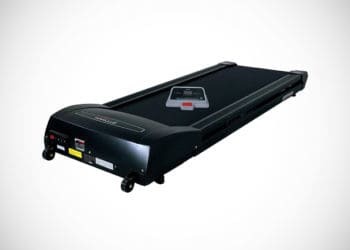 The first treadmill for work in our guide is this rather awesome Rebel Treadmill 1000 under desk treadmill from Rebel Desk. Rebel Desk is a company that was established by Kathleen Hale after she had put up with the pain and strain on her joints and muscles that working at a desk all day, long enough. Thus, the office treadmill was born. As one of the first purpose-built treadmills for work on the market, it’s still one of the best. With Rebel Desk you get a slick, appealing and reliable exercise station that, although it’s simplistic and minimalist in design, this makes it a fuss-free piece of equipment. If you don’t like having to deal with a complicated setup or assembling your office treadmill, then the Rebel Treadmill 1000 is perfect. It comes fully assembled, weighs just 88lbs and is easy enough to setup. All you need to do is take it from the box, roll it into place beneath your standing desk or any tall counter, place the connected console onto the desk and press start. There’s really nothing else to it. With an ultra-quiet 1.5hp DC operation motor, you’ll be able to walk while working, without fear of disturbing your fellow colleagues or anyone else you may be talking to. That includes those on the phone, on video chats and just people in your office. Robust and sturdy, the Rebel 1000 has a stainless-steel construction and as capable of handling a maximum weight of 250-pounds, it’s a good allrounder. The fact that it comes with a 20-years warranty for the frame, 2-years warrant for the motor and 1-year warranty for labor and parts, means your significant investment is suitably protected. There’s cheaper models on the market. This much is true, but if you’re looking for more than just an affordable treadmill, but one that’s effective and easy to use, then this is a great option. Consider being a Rebel Desk Jockey, with this great treadmill. 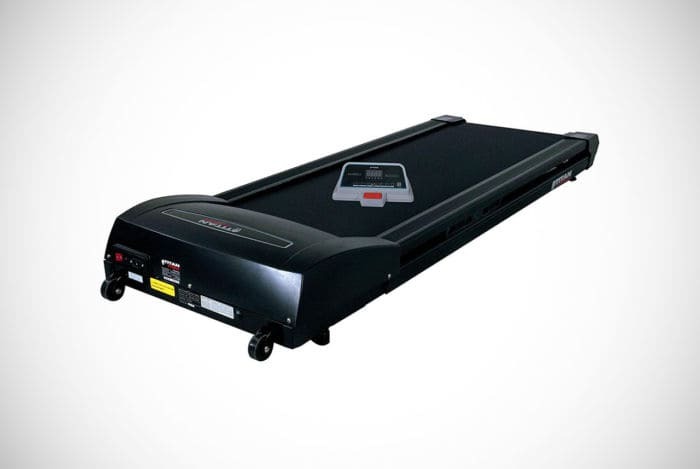 Next up we have the LifeSpan TR1200-DT3 model, which is a streamlined and upgraded version of the manufacturer’s TR800-DT3 treadmill. This has been built with a much lower step-up height and wider walking area. Given it’s got a slightly more powerful motor that provides 2.25hp, compared to the above, it still works surprisingly quiet. That’s even regardless the intensity or speed of your workout. This obviously makes it highly desirable for both home and work use as an under desk treadmill. The console that comes with the TR1200-DT3 has a cool, contemporary look and feel and is small enough to sit on a desk, beside your phone and computer without taking too much space up. LifeSpan have also ensured that the console is quick and simple to use and as well as starting and stopping the machine, you can also alter the speed from 0.4 all the way up to 4mph. From the screen you can check out your progress during workouts, with metrics for step count, elapsed time, calories burned, distanced covered and speed. Thanks to the Bluetooth connectivity, you can sync the console with the exclusive Active Trac App and use this to monitor your fitness progress over time. This obviously helps you by giving you greater control over your workouts and the results you gain from them. Rather than relying on a pedometer, the treadmill uses Intelli-Step to record the number of steps you walk during a workout. There’s also the addition of the Intelli-Guard feature that detects any non-movement and pauses the belt automatically incase you have stepped off it to use the toilet or deal with a call or an appointment. If you’re looking for a durable starter under desk treadmill that provides you with enough features, has a large weight capacity and more comfortable walking area, this is for you. 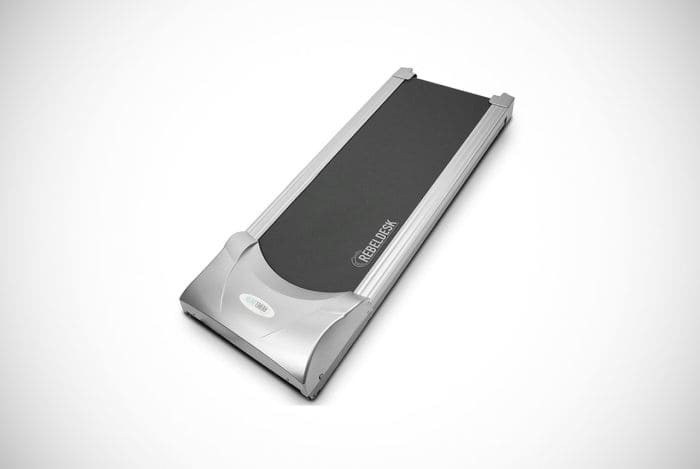 The IPO Folding treadmill won the reddot award 2018 and it’s not hard to see why it was considered a top product. 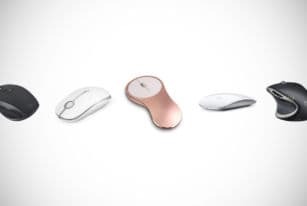 It’s got an incredibly slimline design that borrows from modern smartphone designs, integrating sports tech and pushing the standards for treadmills. The width of the running belt is a roomy 18-inches, the same width as standard treadmills found at gyms. Despite the size though, it weighs a rather lightweight 64lbs, 200% lighter than a standard model. What we especially like about this is the various storage options it benefits from. For starters it has a pulley-style design that means it can be moved and slid out under your desk or out from it, as necessary. As they’re made from great rubber, they are highly resistant to wear and tear, and won’t scratch the flooring in your office or wherever you set it up. As well as its slimline and low profile making it easy to store under things, it also comes with magnetic wall stickers that mean it can be affixed to the wall when its not being used. In terms of using it, this has been kitted out with smart, interactive features that make controlling it a cinch. To start the treadmill, you take three steps. To speed it up, you run or walk faster on the front section, and when you want to maintain speed you move to the middle section and then to lower your speed again you move to the back. The digital LED display allows you to keep track of your distance, steps and time. Again, this is another that’s powered by a strong, but quiet motor producing 0.5hp. 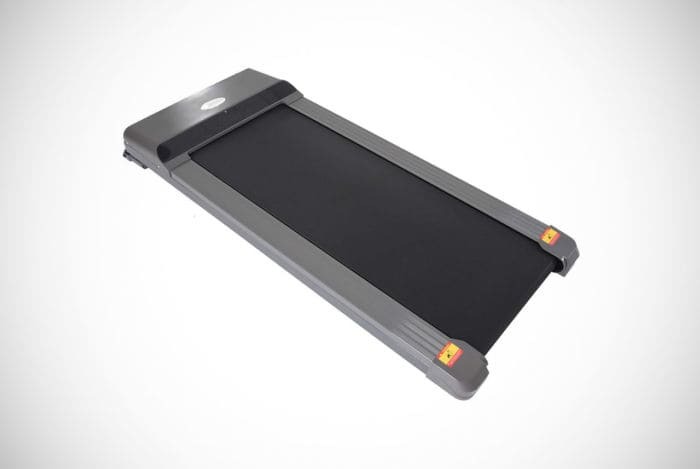 From the highly regarded and industry leading gym equipment and fitness brand Titan Fitness, comes the next under desk treadmill in our guide. Its walking area is similarly wide like many others in our guide at 18-inches, while being a little longer at 53-inches. Despite its bigger size though, it still retains a similarly low-profile of 8-inches high and is therefore compatible with a wide variety of standing desks. Titan Fitness have also ensured that it’s virtually good-to-go straight out of its box. You simply need to plug it in and press a few buttons and you can start working out as you work. With the Titan Fitness under desk walking treadmill, you get the benefit of a handy and incredibly detailed computer. Metrics displayed on the screen include time, speed, laps, steps, distance traveled, and calories burned. There’s also buttons that enable you to select different speed options, whether you’re adjusting it using the presets or the up and down button. You also start and stop the machine from the computer console. 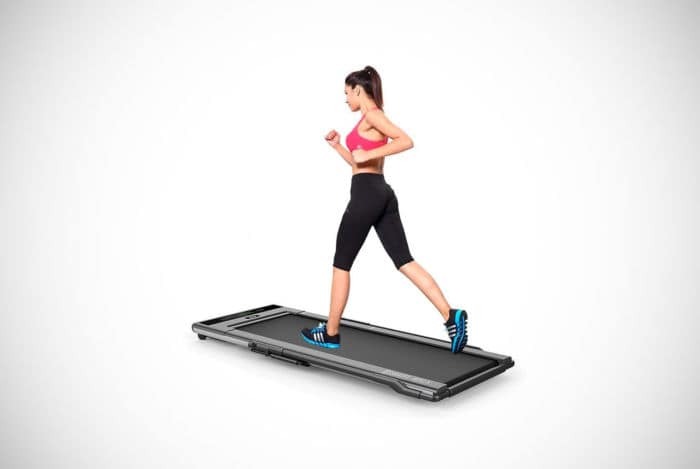 Speaking of speed, this treadmill can run from 0 to 4mph, so isn’t really designed to run on, but will provide more than enough of a walking workout for you. A nice bonus for this treadmill is the fact that it’s compatible with the FITSHOW App. You can use this to track your fitness routine and progress over a longer period than just each day. Really, if you’re looking for a no-nonsense at desk treadmill, the Titan Fitness might be a great option. 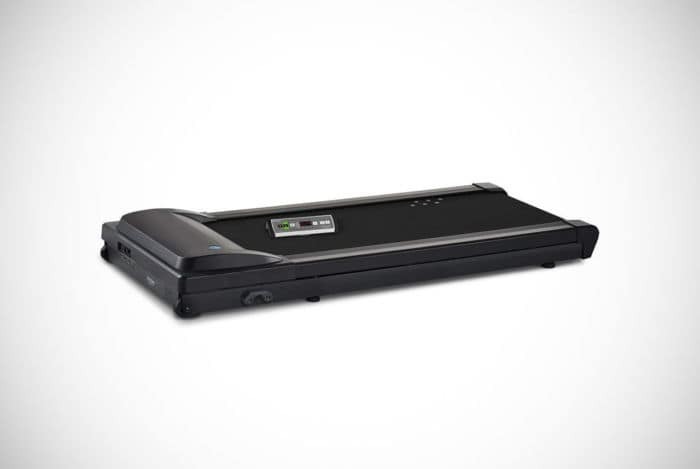 From iMovR comes our next one, namely the ThermoTread GT Desk Treadmill. This is a very professional and aesthetically-pleasing machine that’s been made with at home and office use firmly in mind. One of the things that iMovR have clearly put a lot of time and effort into is the noise level generated by the treadmill and its working motor. Even as it produces a healthy and robust 3.0HP and 4000RPM, it still only produces around 42.7dB of noise. For those of you whom that’s just numbers to, that’s less than the noise generated by a standard office HVAC system. So, if you’re looking for a quiet operating model, this could be for you. That’s not all though, as the motor has been specifically designed with lower speeds in mind, it remains reliable and lasts for much longer than running treadmills. Its maximum speed may not sound too impressive at 2.5mph, but trust us on this, that’s more than enough when you’re trying to field sales calls and carry out boring data entry on Excel. The lower speed also makes it a lot safer to use in the work environment and you’re less likely to experience fatigue or cardio exhaustion. The clever design also benefits from a silent-running cooling fan that stops the motor burning out, even when it’s used every day for several hours. The cherry on an already tasty piece of cake (sorry, speaking of cake might not be doing a lot of good when you’re trying to keep fit and lose weight, but anyway), is the console with its clear and bright LCD touchscreen. This is as easy to use as a smartphone and therefore not like those complicated monitors at the gym. It displays metrics such as your distance travelled, walking speed, walking time, standing time and of course, calories burned. It also comes with a USB port for downloading upgrades to the software. Bakelite material that’s 1-inch thick has been incorporated to give the treadmill a more stable standing and this is also bolstered by 6 shock absorbers. Awesome. Last in our guide is this model from Conquer Equipment, who have been offering high-quality fitness equipment, standing desks, racing products, cycling accessories and a whole lot more since back in 208. So, yes, they know a thing or two about designing and producing under desk treadmills that are high-performance and easy to use. That’s exactly what could be said about this electric walking treadmill. Its low-profile and compact design makes it the perfect choice for your home office or business premises. The fact that it’s on the market for such a competitively affordable price, makes it hard to pass on. Consider its price though, you’d probably imagine its low speed would be much lower than its 0.6 to 3.7MPH but Conquer Equipment do know their stuff. If you’re worried about lugging it around from one place to the other in your office or home, don’t. Conquer Equipment have ensured that it can be easily moved and stored, thanks to the two wheels incorporated into the front of the machine. Additionally, it can also be folded up vertically to a space-saving 53-inches high. From the moment you get your hands on this cool thing, you can use it, as it does not require any assembly whatsoever. So, if you’re not a fan of flatpack and complicated upside-down instructions, it’s for you. There’s no clunky console. However, you do have the benefit of a remote control. It can be a bit of a pain having to bend over to turn on and off your treadmill, especially if you’ve already worked up quite a sweat. With the remote control though, you can start, stop and adjust the speed of the treadmill. Although we’re not going to discuss it in detail here, it’s worth noting that Conquer Equipment have designed and produced several excellent accessories, such as the Portable Standing Desk Workstation and the Height-adjustable Standing Desk. Check them out. Even though we’ve managed to present you with an easier an easy to digest guide to what we feel are the 6 best treadmills for walking on while you work that are available now. It may be that you need help with whittling that list down further. We don’t blame you, as there’s not too much between many of the treadmills highlighted above. Of course, one of the best ways to figure out what would be the best treadmill for you and your work environment, would be to look at the things you need to consider when buying one. In this section, we’ve listed the features, specification and other details that you should always think carefully about when choosing a at your desk-style treadmill. 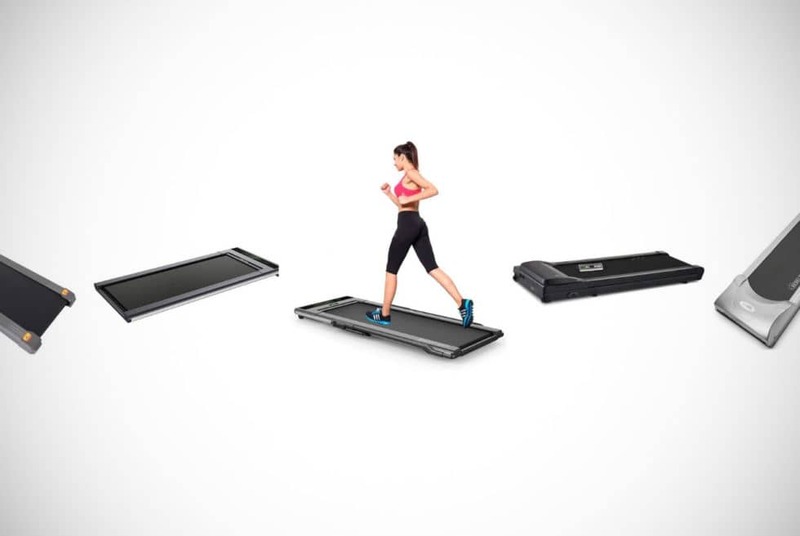 Brand – As we will discuss in greater detail towards the end of this guide, there’s a huge difference between a treadmill that’s been designed for walking on and one that’s a running treadmill that’s been repurposed. Why are we noting that here? Because, in order to ensure you buy one specially-designed for walking on, you need to choose a reputable brand. The brands whose products we’ve reviewed above are 6 that we would highly recommend. Price – The cost is never something you should solely make a buying decision on, but it should always be taken into consideration. Under desk treadmills are available at various price points and this is usually dictated by the range of features they have. In order to get the best under desk treadmill, you need to consider features you really want and whether your budget will allow it. 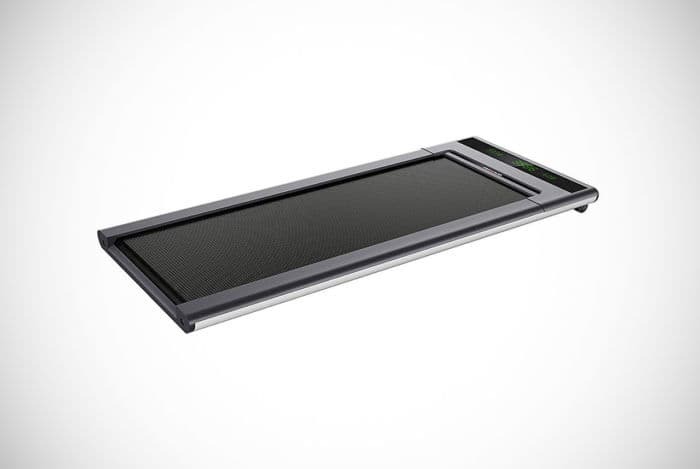 Treadmill Weight – The actual weight of the treadmill is something you’ll have to think about. If you’re intending on moving the treadmill at all or need to because of work or cleaning being done in your place of work or home office, it’s better that its as lightweight as possible. That’s why we’ve highlighted that specification along with other important details for the treadmills we’ve reviewed above. Capacity – Although this is hopefully common-sense, it’s important you check the maximum weight capacity of an under desk treadmill before investing in it. Not all are designed and built equally, and it’s important to find the right one for your size and weight to prevent accidents or damages from occurring. It may be a little humbling, but you need to be honest with yourself and buy the treadmill that’s most appropriate for your actual weight, not the weight you are in your head. Noise Level – Obviously, as you’ll be working while working out, you need to pay close attention to the level of noise different under desk treadmills generate. This is especially important if you work in a busy office space with others or spend a lot of time on the phone, talking to colleagues, customers and/or clients. No-one wants to hear something that’s even louder than the office air con unit or a trash compacter working through tons of garbage. Several of the treadmill models featured above benefit from having near-silent running motors powering them. Safety Features – Safety should always be a priority when using exercise equipment. It’s best to look for a treadmill with as wide a tread as possible, for the available space you have in your office or workplace. Many under desk treadmills come complete with shock absorbers that help reduce the chance of experiencing pain in your joints, muscles and bones. Many models feature emergency stop keys and other automatic stop functions. Console – While the largest part of the treadmill will be the desk component, if you’re looking to get the best out of your daily workouts as possible, it’s important to find one with a good console. It should have a clear and visible screen to provide you with the necessary metrics and data you need to assess your performance. Although many don’t, most highlighted above feature some display and console of some kind. Metrics worth ensuring that a treadmill tracks and displays includes – time, speed, steps walked, distance travelled, and calories burned. Speed – The speed capacity of under desk treadmills is also important, because although you will spend most of your time working and walking, there may be breaks from work when you want to run. Having a treadmill with and adjustable speed, is obviously a must. Remember, you’re not looking to be racing to a sprint, but you want a reasonable range to choose from. Available Space – It’s also important that you consider the available space you have under your desk. The dimensions have been highlighted clearly in the specifications of each under desk model we’ve covered in our guide above. If you’ve got a particularly small desk, it may be worth investing in a larger one. As under desk treadmills are meant to be used with standing desks, you should measure for one to ensure you have the available space. 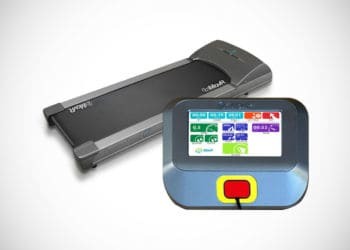 Handy Extras – In addition to the above many under desk treadmills feature notable extras, whether its extra functions, features or accessories. Remote controls are especially handy, as they give you the convenience and hassle-free ability to switch your treadmill on, off or alter the speed without reaching to touch it or even the console. Another handy extra is USB ports and Bluetooth connectivity that helps you to sync up the treadmill with your smartphone or activity tracker. This adds a whole extra dimension to your workout and allows you to track your progress more comprehensively. Perhaps you’re still on the fence a little and need a nudge in the right direction as to whether you should invest in one of these special treadmills or not. Obviously, any amount of working out or fitness you do in your life will help you. However, if the gym scares you or you just don’t have the time available in your schedule, it’s worth knowing just how good walking can be for your health in general. To give you an idea, we’ve put together a list of the major benefits that come from walking regularly, by using an under the desk treadmill. Walking on a regular basis helps to increase your metabolism and in turn build lean muscles while burning calories and shifting unwanted fat. Helps to improve your balance and coordination, that in turn can not only help your fitness and ability to work out, but also with your ability to work at your job. Can be mood enhancing, so if you’re prone to feeling down or low, or just under it all at work a little, walking can improve your state of mind, while boosting your self-confidence and mental cognition, which contributes to better self-esteem and sleeping patterns. All of which will make you feel more positive about each working day and push you to achieve more and do better. Strengthens your bones and muscles, as it helps to improve your blood circulation. Reduces your chances of suffering from type 2 diabetes, hypertension and even heart diseases by over 50%. If that’s not motivational enough, we’re not quite sure what really would be! Reduces the amount of unnecessary pressure placed on your muscles and joints, while correcting your posture and helping to reduce low back and joint pain. Helps to stimulate your mind, which can have a positive effect on the quality of your work and your productivity levels. Before investing in one of the great treadmills we’ve featured above, its also worth thinking about how you use an under desk treadmill properly. We’ve highlighted some of the important safety considerations you need to make to ensure you get the best out of using an under desk treadmill. Note the Weight Capacity – The maximum capacity is not there just for fun, it’s there because that’s the amount of weight that treadmill is able to cope with, while in use. Even if it does run for some time with more weight than stated in the paperwork or in our review, over time it will eventually wear down much quicker than it would if you’d followed the guidelines. 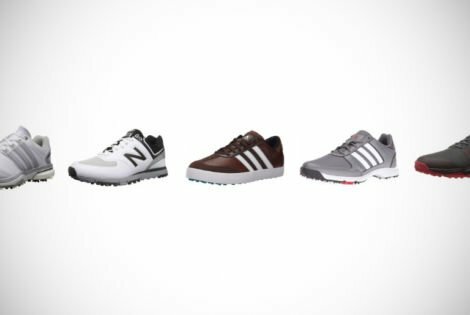 Footwear – First things first, invest in a good pair of shoes that encourage good posture, won’t damage the treadmill belt and are, crucially, comfortable to wear for long periods of time. Walking speed – Ideally you should aim to walk at a speed of around 1 to 2mph while you are working. Although you can build up your speed a little, you need to be careful because the faster you walk, the faster it may be to speak on the phone and use the computer. Additionally, walking too quickly too soon will increase how much you sweat. Safety Clips – Most under desk treadmills come with safety clips. Even if you’re sure you won’t fall, it’s still best to use these as they will prevent accidents. Session Length – Although you may be tempted to walk on your under desk treadmill all day, you don’t have to. It’s thought that around 30-minutes a day is a sufficient amount of time to spend walking. Particularly in the beginning anyway. As you get used to it, you could consider increasing your session lengths. As the demand for treadmills suitable for under desks and in workplaces has increased over the last decade or so, you will find that there is a huge difference in quality. While many under desk treadmills are designed specifically for use in the workplace and in offices, others are simply retreading of treadmills that were designed for use in a gym setting. Although that might not seem like a particularly big deal, there are some differences between the two that are important to note. The speed range, for example, is one area where there’s a big difference between workplace treadmills and those that have been repurposed. If the treadmill has a speed range of anything more than around 4.0mph, then it was probably used in a gym or as a home gym treadmill before. Office treadmills tend to be quieter too, so if you find a model that makes a lot of noisy, it may be the case that it is just a running treadmill that’s been remarketed or repurposed for the working walkers crowd. There’s also the important fact that running treadmills are not generally designed to function well at lower speeds over longer periods of time. They simply don’t have the appropriate motor torque rating for this kind of use. If you’re a little confused, let us explain it a little better. If your treadmill has a peak torque range designed for higher walking and running speeds, it will burn out far quicker if you are only using it for slower walking speeds. So, if you’re looking to walk on a treadmill at work, you need to invest in one that has been specifically designed with that use in mind. You can usually tell this, over and above the tips mentioned above, by whether it’s from a reputable brand. For example, Rebel Desk, Conquer Equipment and iMovR, along with Titan and LifeSpan all make purpose-built standing desk and workstation-compatible treadmills. That’s it dudes, we’ve reached the point in our guide where we like to take a little time to wind things up. We really hope you appreciate the work we’ve put in and enjoyed looking at the different options for treadmills that are suitable for under your desk, whether it’s at the office or in your home. 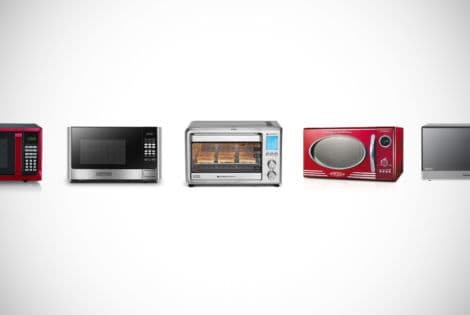 We’re sure we’ve shown enough of a variety that you’ll be able to find the right model for you. You really need to decide whether you want to invest in or not. That’s why we’ve emphasized the benefits in our buyer’s guide. Before all that though, what have we learned from our look at the best of the best compact walking treadmills? We’ve learned that there was more choice than even our team at Men’s Gear were aware of. That’s saying a lot, considering how much we love gadgets and gizmos here. There’s a wide price range, sure. What we were very surprised about though, was the fact that very often, some of our favorite models were the lower-priced models. That’s not to say that the most expensive, weren’t worth the investment. But it just goes to show that price isn’t always the best thing to guide whether something is of good quality or not. There’s more involved. That’s why when looking for that treadmill that you can use with that fancy workstation or standing desk, that you should always consider more. You’ll undoubtedly have a budget, but you need to think about things like weight capacity, the level of speed you want to walk at and how detailed you want to be able to track your progress. Determining these, will help you to figure out the best model for you. With that, there’s not a lot else to say. It’s a more crucial time than ever to break from the trappings of our sedentary lifestyles. With obesity and other health issues a real problem, one way to combat this is with these ingenious fitness machines. Just walking 20 to 30-minutes a day can make all the difference. So, really, what are you waiting for exactly? 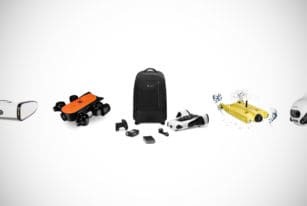 Live out your wildest underwater exploration dreams by diving headlong into our wonderful world of the coolest underwater drones, where the future means the ocean. 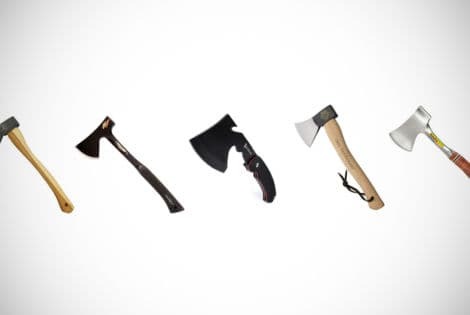 Cut yourself free from buying low-quality camping hatchets by choosing one of the models on our buyer guide instead. 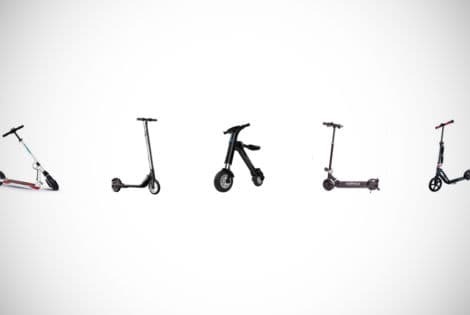 Forget about sitting in hours of stressful traffic each week and conveniently commute to the office on an electrical scooter full of modern features and impeccable style.